Enter a dreamlike world where nature, design and technology come together to create a mesmerizing, playful retreat. Photography comes to life on the walls of the rooms, playful sculptures salute guests at every turn and imaginative art tickles the mind. The striking geometric structure of the hotel is a work of art unto itself – the cover to a storybook that has many secrets to reveal. The perfect setting for an Imaginative Escape. A place that dreams are made of. SO Sofitel Hua Hin is the ultimate escape destination for pure luxury and relaxation. 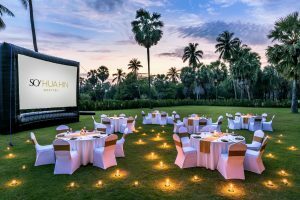 This 5 star resort situated in Cha-Am, 30 minutes from Hua Hin, offers a transcendent selection of 109 spacious rooms and villas to let guests experience tropical beauty at its finest. 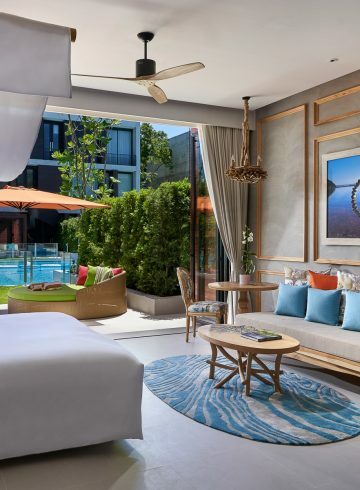 Lavish decorations adorn the arty and nature-themed rooms at this celebrated beach resort in Hua Hin, making SO Sofitel the perfect getaway for couples and families on holiday. Special pool villas are also available for special occasions, so guests can take in this lovely beachfront setting while experiencing the height of luxury. Join the SO Tribe to connect with like-minded travelers who are looking to lead, not follow. Share your photos and speak your mind.